Fill out our simple form and get quotes from local red bus hire companies. 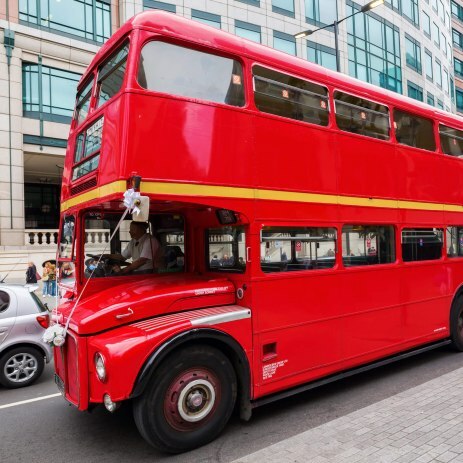 If there ever was a truly British icon of travel – the big, bold, double decker bus is it! Red bus hire is a fun, practical and iconic mode of transport for a wedding, prom or private party. All aboard for a day to remember! 1950's vintage bus available for weddings, corporate events & special occasions. Our bus can carry up to 56 passengers and provides a unique transport experience. Red Bus Bistro Company Ltd. If you have a large number of guests to transport from A to B big red bus hire is an unforgettable option. Complete with ribbons, flowers or your choice of décor this nostalgic form of transport will get everyone talking. Double decker party bus hire is available across the UK from a number of expert transport suppliers who will chauffeur you safely to and from your chosen destination. We’ve mentioned weddings, proms and parties, but red bus hire is also perfect for corporate events or festival transport, if you’re looking for something a little different at a competitive price. You simply need to browse suppliers and complete a free quote request form to hear back from double decker bus hire suppliers in your area.